Cool, nice choice of colours. Yes, and I have heard that the English did use the longbows for many centuries and the last time that the longbow was used in a large battle should be at the battle at waterloo. It was first at this date that the rifle was so reliable, precise and fast to reload that it could outmatch the longbow. On average it Looks as if the Scottish cavalry numbered around 500 so two stands of 5 a Piece should cover them. Nice indeed and the Scots looks a lot like the ones from Braveheart, I do like them but historically I think that the Scottish noble would have been dressed quite similar to their English counterparts? 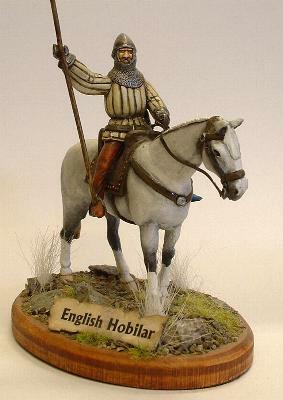 They will all get barded horses ..those that havent already..and i may (if i have time and Money) replace the scottish cavalry with a load of barded horses. I´t will look much better. Lovely! Just love seeing your shields... can you give the link for your manual again? The shield Patterns here are randomly taken from the early blazon site and all over the web. I´m making up a contact sheet with as many as possible on it, all scaled down for 1/72nd and when it´s ready I´ll make it available as a PDF here. I´m also making one with all the english and scottish coats-of-arms (also scaled for use in 1/72nd) but they will take a bit longer..the names etc are being added next to each coat-of-arms and it takes a lot of Research to make sure I´m getting the right ones. I don´t like to rebase but I wasn´t happy with the size of the bases anyway. I will go for two to a base, one Knight, one unbarded (maybe with a flag) on bases with a 4cm frontage so when 3 blocks are together they have a 12cm Impetus frontage.